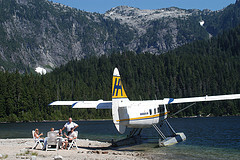 Our most spectacular tour departs Vancouver Harbour and features the hanging glaciers and knife-edged ridges of Mount Mamquam (8,450 feet / 2,600 metres) and a landing on our “secret” alpine lake, where the air is fresh and the water is crystal clear. The flight gets you up close to the hanging glaciers and knife-edged ridges of 8450 foot Mount Mamquam. You’ll land on the lake and taxi to the lake shore where you’ll have 15 minutes to enjoy the solitude, or if you add a picnic lunch, you’ll have an hour to explore and experience the silence. The air is crisp and fresh and the water is crystal clear. Why not add an optional picnic stop to your tour? Add one hour at the lake with a delicious picnic lunch for $52 additional per person.